Entrants Get a Discount for the Conference! Submit your play and register for this year’s Conference at the same time! All entrants receive a discount on Conference Registration. Second Rounders and above receive greater discounts. If you register now and advance (notifications sent in mid September), we’ll gladly refund you the difference. To register, simply select which badge you’d like to purchase in the submission form below. AFF Competition Award Winners will be awarded alongside our 2018 Festival and Conference Awardees at this year’s Awards Luncheon. Before proceeding with the online form, please make sure your play adheres to all rules and formatting. If you have problems using the online submission form, please try using another browser and make sure you are allowing pop-ups. Once submitted, no revisions will be accepted. To submit by mail, please see instructions at the bottom of the page. Check these 5 things before you submit! Step one in your playwright career: submit your script. CHECK! Step two: join us in Austin in October and let us put you in a room with the writers you admire most, and throw you a party to mingle with the folks you can’t get meetings with anywhere else. How? Buy your badge now before prices go up on June 1! *Submissions will only be processed when the online form and payment have been submitted in the same session. Submissions are not received until payment has been processed. Once you have paid via PayPal and have your PayPal receipt, your submission is complete. 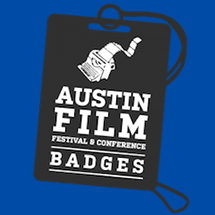 Due to high volume of submissions, a separate email confirmation from Austin Film Festival may not be received immediately, and will be sent within five business days. Please include a self-addressed, stamped postcard for each submission if you would like acknowledgement of the receipt of your entry. Mailed in submissions must be postmarked by deadline date to be eligible.